Huddersfield Town star Rajiv van La Parra says his loan spell at Brighton & Hove Albion in the 2015/16 season helped get his career back on track. Van La Parra had been in and out of the Wolverhampton Wanderers side when he came to the Amex and he has hailed Albion boss Chris Hughton for helping him get his confidence back. The 27-year-old Dutch winger spent two months on loan at Albion from Wolves in the 2015/16 season and scored twice in six appearances. He was on target in 2-2 draws away to both Derby and Queens Park Rangers. After the loan spell, he returned and played a few matches for Wolves, before joining Huddersfield in March, 2016, initially on loan before making the move permanent that summer. He has now played 97 games for the Terriers and was part of their promotion-winning squad from the Championship in 2016/17. Brighton ran out 2-1 winners at the John Smith's Stadium yesterday and talking to the Huddersfield matchday programme, van La Parra, who wasn't in the 18-man squad, said: "I have really good memories at Brighton. I think that when I was at Brighton I wasn't in the best part of my career and they helped me to get back to where I am now. "I'm really thankful to the club, especially the manager who brought me in. "The manager gave me the opportunity to make minutes and play games and he gave me a lot of confidence to do what I'm best at. After a while, it worked out really well." Van La Parra added the way the Seagulls played suited his game: "Compared to now Brighton were more offensive. Obviously they were in the Championship at the time and they were competing to get promoted, so it was really offensive. "It really suited my style of play and I think that's the main reason why it worked out really well for me. 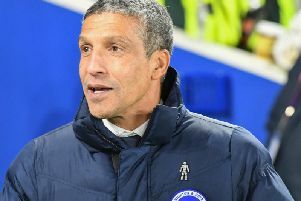 "Chris Hughton just let you do your thing in the final third and told you to make things happen - that's what he always said. "When I was there you could see what their goal was, and their aim was to get promoted and be a Premier League club. "They had all the facilities to reach it and now they've done really well in the Championship, got promoted, and are doing pretty well in the Premier League. That's what their aim was and they finally made it happen."